Would You Live in a Haunted House? Or, more to the point, would you stay in a house once you find out that it’s haunted? The first weekend after we closed on the Dollhouse we came up here and “camped out” in the empty house with an air mattress, our laptops, and a smattering of household goods. While it was strange sleeping in an empty, unfamiliar, echoing house, nothing out of the ordinary happened on this or any other weekend spent up there. When we moved in 2 1/2 months after closing, our a/c went on the fritz and we, again, slept downstairs for the first few nights until we could stand the heat upstairs. That’s when things got a little weird. While ToddÂ slept on, blissfully unaware, I was awakened multiple times in the night by a series of 4 knocks coming from who knows where–I certainly wasn’t about to go investigate! There were also sounds of boxes being slid around the wood floors downstairs–that creeped me out the most, even if nothing was out of place the next morning. I was not amused; mostly I was just tired! Fortunately, I’m not exactly a novice when it comes to the woo woo side of things.Â I read Tarot cards and have even (successfully) run aÂ Ouija board in a haunted hotel as part of a paranormal workshop. I consider myself fairly intuitive, but I’m not sensitive to ghosts–my gifts only work with the living.Â But I was determined not to have a repeat of the previous night’s experienceÂ so–through meditation/visualization–I put up a “security blanket” around the house to ward against any metaphysical mischief. I also may have told the house, aloud, ‘Not tonight, Momma needs some sleep!’ It seemed to work, the strange noises didn’t repeat. So, was it a fluke or do we just have very polite spirits? At last year’s Halloween party, knowing that a couple of my guests are sensitive to ghosts/spirits, I took down the security blanket (but left up a net–I’m semi-brave, not fully stupid) and told anyone listening that as long as they could play nice, they could come play that night. I absolutely admit that I was full-on curious, but I didÂ notÂ request my friends to read the house, what followed was completely voluntary, and the two friends that were able to give me information do not know each other outside of possibly meeting at previous parties of mine. I’d just finished one of the house tours when Friend M told me “You’re not alone.” Okay then! Apparently she encountered 2 spirits in the house, but they just seemed curious about what was going on. Fair enough. She wasn’t able to get much more from them as she wasn’t feeling well that evening and she admitted that it was screwing with her abilities. Friend S, though, really clicked with one of the spirits: a woman, appearing to be in her mid-30s, who was excitedÂ that there was laughter in the house again after so very long of being tired and down. S did not yet know that the house had been rented out as a personal care home for the last 10+ years and was vacant for a time before that. I don’t doubt for a minute that the state of the house when we purchased it reflected the state of the “care” the patients received during their time here, and the vibe of the home in general. But that wasn’t all she shared! There is a section of the staircase that she is uneasy on, that she clutches the railing for dear life as she goes down. It was either that she’d fallen down them or that she’d witnessed a fall. Also, in what is now my office, there was an argument of life-altering sort/things-that-cannot-be-unsaid vein that took place between a man and a woman. 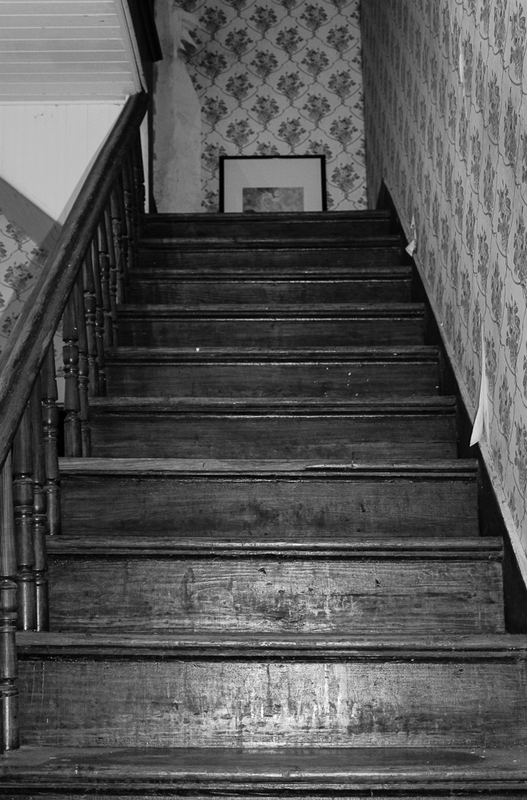 In my research into the house’s history (which S did not know until after these revelations), I’d learned that the original owner of the home did take a tumble down the stairs and was hospitalized from his injuries. And I believe it was shortly before his passing, if not the eventual cause of it. So, if it was his fall that the woman witnessed, that could make her his daughter. And I also know that the daughter was a school teacher and never married, living out her days in this house at least through her retirement, so I got the impression that theÂ argumentÂ might have beenÂ over a suitable suitor. She didn’t seem to indicate (via S) that this was wrong, but there wasn’t anything in the newspaper archives on that subject! At this year’s party, M again noticed the spirit upstairs. I asked her what, if anything, she could tell me about him, and once again she said it was a curious spirit. He was, she added, not all that interested in communicating and that it almost seemed like the party downstairs might have “woken him up.” This spirit seems to hang out in our guest room (apropos, no? ), but future house guests have nothing to fear. My aunt stayed up there last Thanksgiving without incident. So the question becomes, what do we do about it? Currently we’re on the side of nothing. While I’ve been chided by some that I shouldn’t be “keeping them here” and that I should help them move on, again, that’s not my talent and I’m not doing anything to hold them. Between the smudging we did before moving in and the “security blanket” that is back in place, I’m actively trying to keep negative energies out of the house. I believe that there’s a higher chance that these are residual energies, imprinted on the house over the years. If either spirit is “active” here, I hope it’s because this is a place they are drawn to on their own and feel comfortable with. As long as that’s the case, I say live and let live. Or, uh, you know what I mean. It’s definitely situational–if the activity in the house was negative then we’d definitely do something to correct it, but for now the reality isn’t all that different from the non-haunted houses we’ve lived in. I grew up with Mom telling us about the ghost in my grandfather’s house, so I guess I’ve always believed in them. What they represent, what they can do–that’s all sill in the ‘who knows’ realm. I don’t know what I would do! Kind of weird, and interesting too! Definitely situational. If it ever got to be an issue we’d take steps to resolve it. I love this kind of stuff. I would keep investigating. If they just wanna be there, let them, right?! I believe that when you die you go to a place you love or you stay with a person you love. Create your own heaven. I definitely would! I love spooky things and ghosts, and I would love to investigate the history! I would stay in a ‘haunted’ house but I would have it smudged first! I just feel like you never know, even if you can communicate! The house I grew up in was haunted. The son of the previous owners has passed away in the house. This name was Tim and he just became a part of our life. That was the case with my grandfather’s house–though he wasn’t a welcome spirit, they just went with it. People don’t have to die in a house to leave an imprint, of course, but that can make it stronger in some cases. To my knowledge no one died here (but, well, we have to trust the Realtor on that one, and, well, there’s reasonable doubt, lol). No, no, no…I would not. I don’t even want to know if my house is haunted. I like living in my blissful ignorance. There’s something to be said for that! Have you seen the story in the news today about the exorcism that’s going to take place on live television? I think it’s happening Friday. (I’m actually kind of stunned they’re not airing it tonight). Maybe you could get some ideas? I looked it up and, yeah, that’s not my cup of tea at all. I’ll totally take living in harmony with the house’s spirits over theatrics and antagonizing them, lol. That works for a lot of people, sort of an unintentional shielding. I don’t know what I’d do if it’s my home. But I guess if the ghosts don’t bother us, then I think it’s alright. Nothing wrong with peaceful coexistence 🙂 After all, they were here first! No no! I’m not a fan of scary stuff! I am scared just reading this so imagine if I lived in a haunted house. I think they are fascinating but could never live in them! I tried to keep it from being too creepy, I just find it really interesting! And that’s a totally valid choice! Ummm…. creepy! I had to stop reading because you were freaking me out! I once lived in a house that had originally been a civil war infirmary on Pea Patch Island, and the house I live in now was built in 1791 and in the (very) early 1800’s it belonged to a doctor and he used it as the local hospital. I was comfortable in the infirmary and I’m comfortable here. I’ve found that as long as you are respectful and mindful you have nothing to worry about. Precisely! I love that your homes have had so much history lived in them. I have no problem living in a house with ‘nice’ spirits or those that mind their own business, but anything that gives me a sense of malevolence â€“ that would be my cue to move. I do not want to live in the midst of any negative energy. Very true, Yona, there’s no need to live with that. There are ways to cleanse negative energy from a house, if moving isn’t an option.